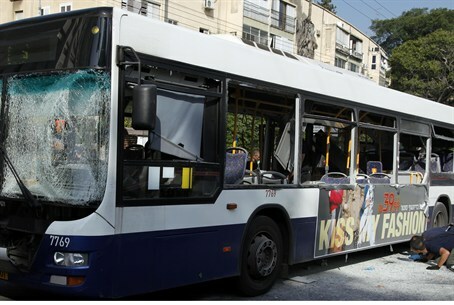 Judge: 'no leniency' for Muhammad Faraj, Hamas terrorist responsible for the November 2012 #142 bus bombing in Tel Aviv. The Tel Aviv District Court sentenced terrorist Muhammad Faraj to 25 years' imprisonment Monday, for his involvement in a 2012 Tel Aviv bus bombing. Faraj, a 19 year-old Taibe resident and Hamas terrorist, personally placed a suitcase loaded with a bomb on the number 142 bus line on November 21, 2012. The attack injured 26 people. "It is the right and obligation of a society that values life to defend itself against those who rise up against it via, among other things, issuing harsh, painful, and daunting punishment," Judge Yaron Levi wrote during the sentencing. "There is no room for leniency with the defendant, who returned to his daily life after maiming his victims - who, most likely, will never see a 'daily life' [as they know it] again." The indictment against Faraj included charges of attempted murder, aggravated assault, and intent to aid an enemy during time of war [during Operation Pillar of Defense].